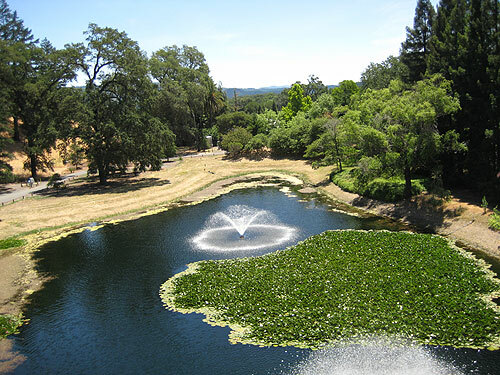 There are literally hundreds of wineries in the Napa Valley, and although I will be mentioning a few landmark wineries as points of reference, my goal here is not to make specific recommendations (we’ll leave that for future columns) but rather to offer some general information that should be helpful wherever you choose to go. If you’re starting from San Francisco, driving to Napa should take roughly an hour and a half to two hours, assuming traffic isn’t too bad (allow more time if you have a scheduled appointment; it may take longer to get further up the Valley, and traffic delays are not uncommon.) The more scenic route would be to cross the Golden Gate Bridge and take Highway 101 north to Highway 37 east, and then Highway 121 through the Carneros District (where a number of notable wineries, such as Artesa and Domaine Carneros, are located) to Highway 29 north and the town of Napa.